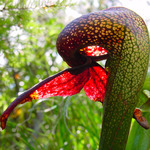 My Darlingtonia House in May 2015. At least the top half of it anyway. Flowering on the older colonies hasn't been as good as last year even though I thinned out all three trays. There are new clones flowering though which all helps with the enjoyment. The three solar water pumps are all still running well and the seedlings appear to be growing very well indeed. How does the tray method work for you? 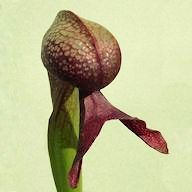 If I were to put a darlingtonia in a pot and do the tray method the water would cook the roots, why doesn't it happen to you? The root temperature has reached 100F before now. It's not a problem. There is only one species. There are people growing this plant at root temperatures much higher than I encounter. The temperature problem appears to be US based. In the mini-heatwave we had at the beginning of the month I had root temperature recordings of 34C (93F) one day and the following day 35C (95F) my friend about 30 miles away rang me somewhat perplexed on the second day. He came back from work and recorded 36C (97F ) which he claimed felt like bath water. All is well with the plants in both collections.